In a mortar and pestle, pound together the shallots and galangal until fine (note about galangal: it's ok to use dried galangal as long as it's placed in a dish of lukewarm water for a few minutes to reconstitute). Add roasted shrimp paste, ginger, coconut and dried shrimp, and continue pounding until smooth. Remove the mixture and place in a pot with 1.5 cups water. Bring to a boil over medium heat, add palm sugar and table sugar, then reduce heat and simmer, wait until reduced to 1 cup or a bit less. Taste, and adjust by adding a bit of salt. Remove from heat and transfer to a small bowl. The choice of what leaves to use is up to you. 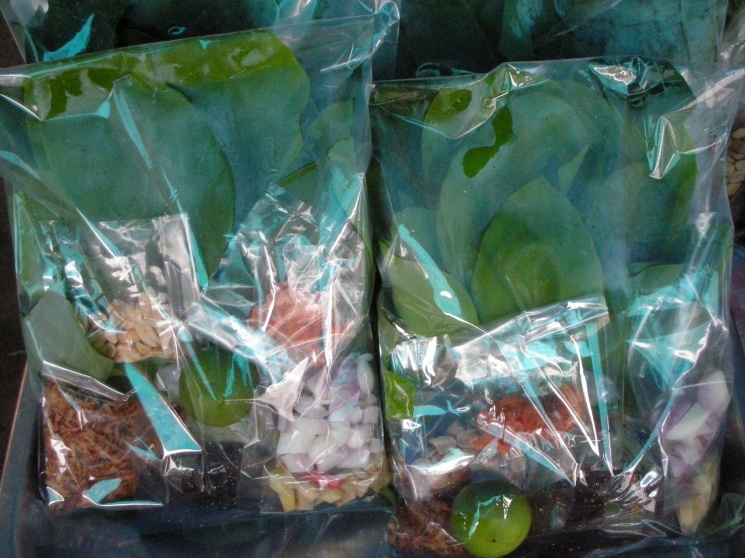 Some use lettuce or spinach leaves due to ready availability, but to get an authentic flavor you should use the fresh cha-phloo leaves offered by ImportFood.com. These leaves are also known in English as Betel Leaves, or Piper Sermentosum. In Vietnamese language, these leaves are labeled as La Lop. Roast the coconut in a low-heat oven until lightly brown. Spoon the roasted coconut into a serving plate. In separate small bowls, arrange each filling ingredient listed above. With a fresh wrapping leaf in hand, fold it once across the bottom then sideways to form a pocket. Place about 1 teaspoon roasted coconut in the leaf together with a small amount of each filling to create a bite-sized quantity. Spoon the sauce on top, pop in your mouth and enjoy! Aren't betel leaves like a drug and can cause addiction? 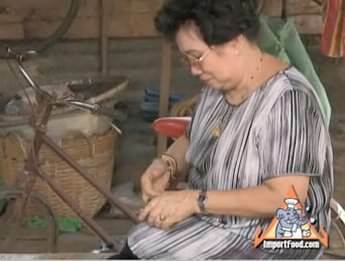 Dear Carolynn, there is an old tradition in SE Asia of using betel leaves together with betel nut and other ingredients to create a stimulant. 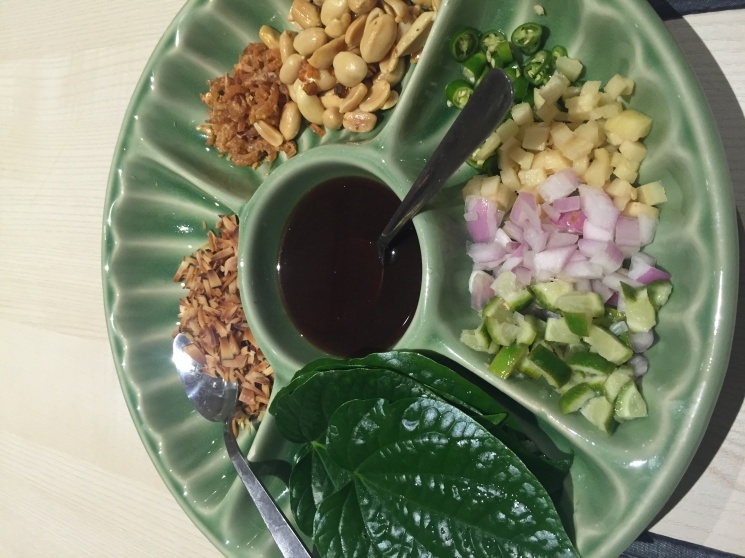 We have described that in detail here in our feature story about betel nut chew. 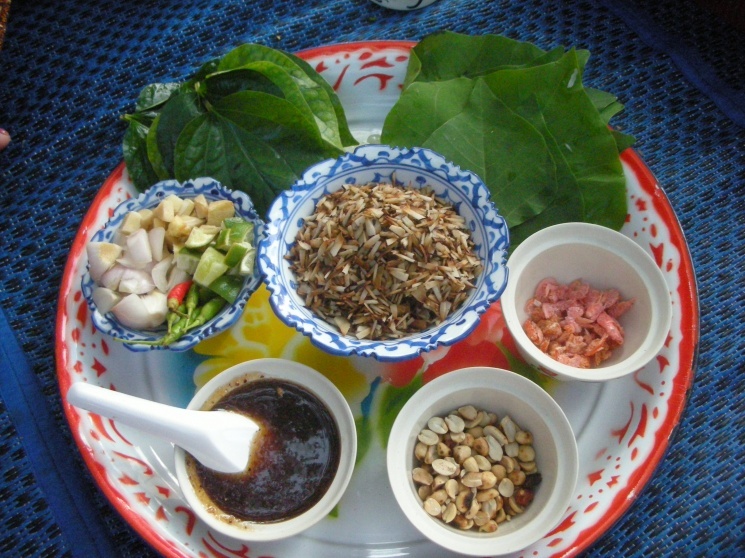 The betel leaves in miang kham are in no way like a drug, but the recipe is a heavenly flavor. I also use coriander leaves and pickled garlic in the filling. It give 9 fillings and 9 being an auspicious number in Thailand it works for me. 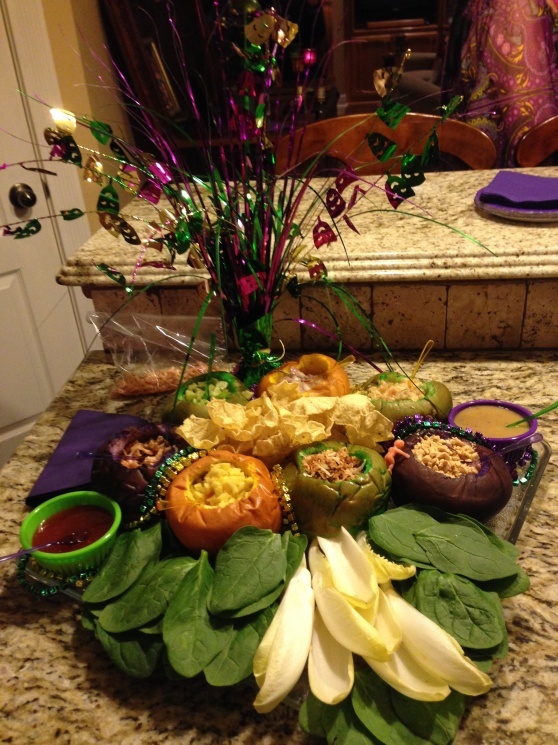 For a Mardi Gras party, I served Miang Kham in food colored buns to resemble a Mardi Gras king cake. I had this on a trip to Thailand and could hardly wait to serve it to our supper club group. I added broken pig skins as an extra ingredient just in case some could not eat shrimp. I could not get betal leaves so I used large spinach leaves which tasted great also. 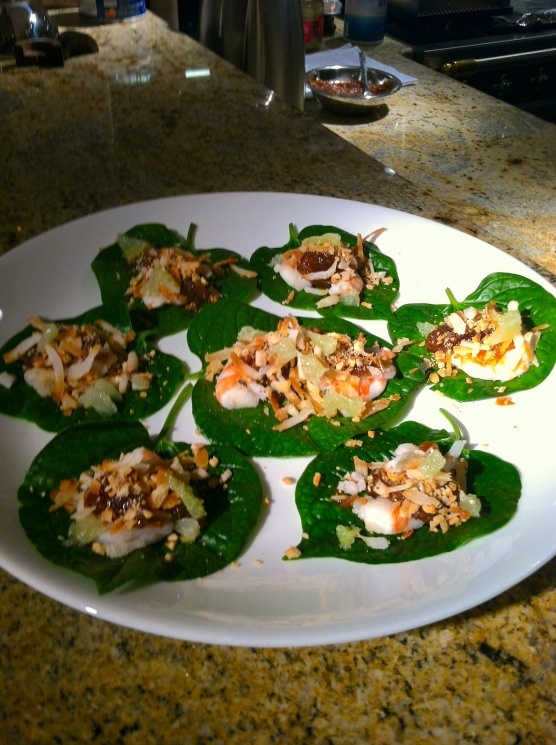 Now that I know I can order betel leaves from ImportFood.com, I will be set to serve this again. This appetizer was a great hit. 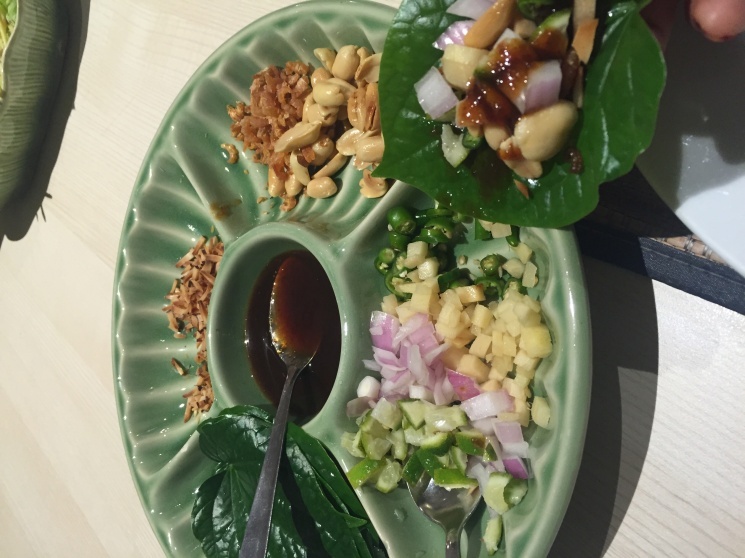 I was in Bangkok last week and was served the delicious Betel leaf as an appetizer. I was so impressed that I took a picture and cant wait to make it at home and impress my wife and guests. This is where I had this plate plus 6 other authentic Thai dishes: Baan Khanitha Thai Restaurant at 69 south sathorn rd . I was fortunate to remember to get one of their match boxes to remember their name/address. I strongly recommend this restaurant by far the best one I visited in my entire week at Bangkok. Good and interesting recipe. Thanks. This is the best recipe I have ever made. I love it!